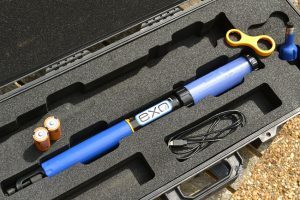 The YSI EXO Sonde is a high accuracy water quality monitoring platform. Measures & logs: pH, EC, Temperature, Redox, DO & Turbidity simultaneously. When connected to telemetry, it will also report water level. 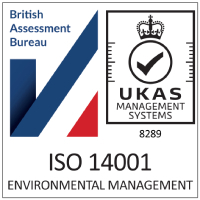 So is the ideal instrument for marine, estuarine, surface and groundwater applications. Computer Interface: Bluetooth wireless technology (between sonde and handheld or computer with KOR software), RS-485, USB; Output Options: USB with signal output adapter (SOA); RS-232 & SDI-12 with DCP-SOA. **Typically 90 days at 20˚C at 15-minute logging interval; temperature / conductivity, pH/ORP, DO, and turbidity sensors installed on EXO1; or temperature/conductivity, pH/ORP, DO, total algae, and turbidity sensors installed with central wiper that rotates once per logging interval on EXO2. Battery life is heavily dependent on sensor configuration. Specifications indicate typical performance and are subject to change. Xenoy is a trademark of SABIC Innovative Plastics IP BV. EXO Bluetooth modules comply with Part 15C of FCC Rules and have FCC, CE Mark and C-tick approval. Bluetooth-type approvals and regulations can be country specific. Check local laws and regulations to insure that the use of wireless products purchased from Xylem are in full compliance. EXO components are not compatible with YSI 6-Series sondes, sensors, or handheld. Output Options: USB with signal output adapter (SOA); RS-232 & SDI-12 with DCP- SOA. *Typically 90 days at 20 ̊C at 15-minute logging interval; temperature/conductivity, pH/ORP, DO, total algae, and turbidity sensors installed with central wiper that rotates once per logging interval on EXO2. Battery life is heavily dependent on sensor configuration.